Yes, the 'lady' in pink is Ian Wright! 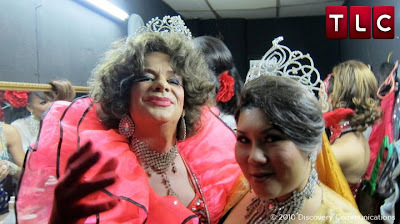 The famous travel host was transformed to a Drag Queen in his show, Invite Mr. Wright. This episode was filmed in Malaysia and featured Joanne Kam Po Po. I just watched this last episode of the show at TLC in Astro. Ian Wright is my favourite TV host! He has my dream job (he travels almost to everywhere in the world in the name of work), he is also a very funny and witty guy. It's always entertaining to watch him. While searching for a suitably photo to put here, I came across a bit of news about him and Kechara Soup Kitchen. Apparently, he volunteered with the Kechara Soup Kitchen to distribute food to the homeless, but it was not shown in the episode. Emm, I wonder why it was edited out?